Vancouver Coastal Health coordinates a number of support groups for people who are caregivers for family members or friends that are aging, ill, or living with a disability. It is so important to look after everyone involved – including the caregivers. The support groups giver you people to talk with in similar situations, provide information about community resources, and a host of other things. Check out http://caregivers.vch.ca or call them at 604-877-4699 or email them at caregiversupport@vch.ca . If you are not in the Vancouver area, they may be able to point you to groups close to where you live. Interested in resources and support for caregivers in the Vancouver area? Vancouver Coastal Health is promoting their resources and group meetings for those providing support to others. 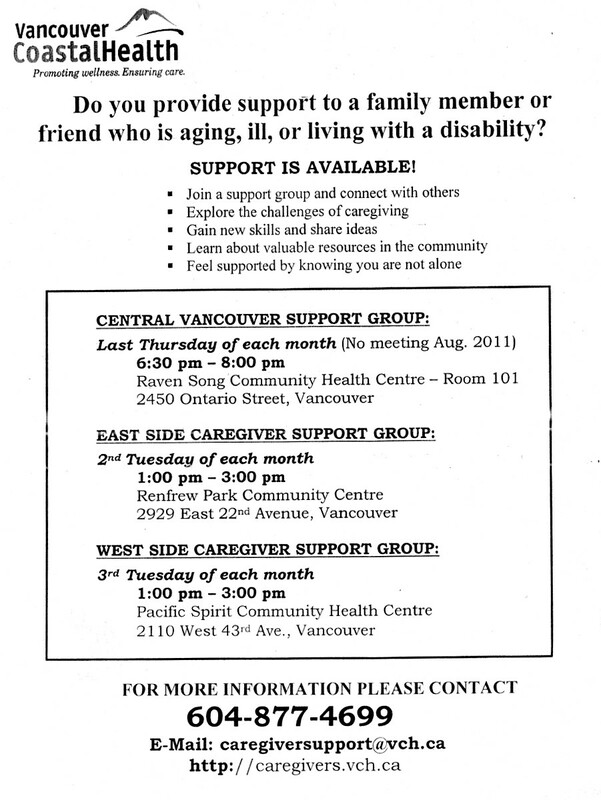 They have monthly support group meetings in several locations around Vancouver. For more information, check out their website, call 604-877-4699 or email caregiversupport@vch.ca.